✔ Each of our products are made of 100% food grade silicone and tested free of any harmful chemicals. ✔ These chewing necklaces are guaranteed under our 100% personal satisfaction guarantee, ensuring the durability and safety of those using this product! ✔️ BRAND NEW TEAR RESISTANT MATERIAL - Our FDA approved premium quality chewing necklaces are made of 100% food grade silicone. Each are tested free of lead, latex, BPA, PVC, and phthalates. The brand new tear resistant material allows the same gentle chewing, but improved lasting quality over the previous version. Completely skin and body safe to ensure the protection of your loved ones! 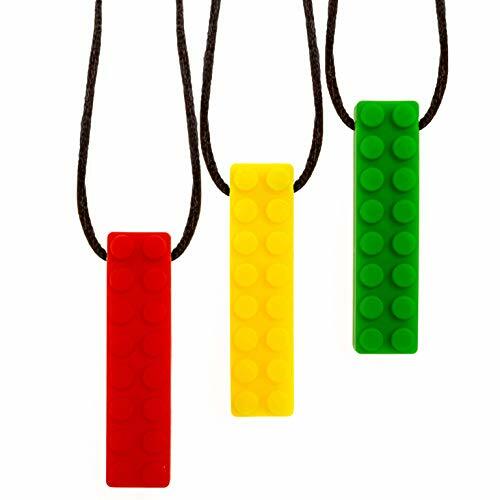 ✔️ EXTREMELY DURABLE AND GENTLE SILICONE (GREAT FOR ALL CHEWERS) - Our chewing necklaces are created for children with autism, anxiety, oral fixations, ADD/ADHD, SPD, special needs, or general teething pain. ✔️ 100% SATISFACTION GUARANTEE OF EVERY PRODUCT - We are so confident in the quality of our products that we back everything with our 100% guarantee, or your money back, no questions asked. ✔️ SAFE FOR EVERYONE IN THE FAMILY - Each of our premium chewing necklaces are equipped with a breakaway safety cord to ensure the safety of your loved ones. Though the use of these necklaces should be used under the supervision of an adult, the safety clasp is added for additional protection. Please note that the cord and clasp are not intended for chewing, only the chewing bricks themselves. ✔️ EASY TO CLEAN AND DISHWASHER SAFE - Our premium necklaces are easily cleaned by hand with soap and water to remove bacteria, or just as easily placed in the dishwasher to remove any unwanted dirt and grime after possibly falling out of a purse or stroller. If you have any questions about this product by Mindful Creations, contact us by completing and submitting the form below. If you are looking for a specif part number, please include it with your message.